“Access to quality care and top physicians is why the Medical Society of Northern Virginia sponsors DoctorsTelemed℠” says Jack Ayoub, M.D., MSNVA Foundation President and owner of Virginia Obstetrics & Gynecology. The Medical Society of Northern Virginia (MSNVA) launches DoctorsTelemed℠, a telemedicine solution that uses CloudVisit’s technology to empower patients to take control of their healthcare costs. DoctorsTelemed℠ delivers online, secure, live video consults by licensed, board certified community physicians directly to patients. DoctorsTelemed℠ area of service includes Virginia, Washington DC and Maryland. 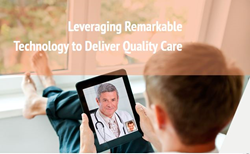 Delivering coordinated quality medical care to patients is a priority. By using DoctorsTelemed℠, patients from the DC metro area can have the added peace of mind of reaching physicians in person if needed. Physicians can also download medical records from other physicians (with patients’ consent) to their own electronic medical records from DoctorsTelemed℠ to ensure continuity of care for their patients. "When it's not necessary to see your physician in person, DoctorsTelemed℠ will help our patients save time and money by getting their medical consultation "on-demand" from home, work or wherever is convenient. We want to help medical care enter the digital age, and MSNVA is streamlining the process to bring patients together with their trusted local doctor. It's win-win for great medicine in our region," says Nancy A. Tanchel, M.D., MSNVA President and owner of Liberty Laser Eye Center. Technology is empowering doctors and patients in more ways than ever imagined in the past. Medical care needs to be patient oriented and convenient. DoctorsTelemed℠ eliminates the frustration of waiting days or weeks to see a doctor and having to complete medical forms every time you see a new physician. Patients who register with DoctorsTelemed℠ can make appointments at their convenience with a physician of their choice or select from the list of on-call doctors for immediate access to a live video consult. “Access to quality care and top physicians is why the Medical Society of Northern Virginia sponsors DoctorsTelemed℠,” says Jack Ayoub, M.D., MSNVA Foundation President and owner of Virginia Obstetrics & Gynecology. Founded in 1884, the Medical Society of Northern Virginia (MSNVA) is the professional association for more than 1,600 community physicians who live, work and/or have hospital privileges in northern Virginia hospitals. MSNVA also operates HeaLixVA℠, a health information solution that enables physicians to securely exchange patient information, receive lab results in real time, expedite electronic referrals and provides secure messaging to tighten patient care coordination. CloudVisit Telemedicine is committed to providing easy-to-use telemedicine & tele-psychiatry software services and solutions for small practices, also scalable for large medical groups and health systems.